We’ve arrived: Sequeltology, Episode Final IV. A new hope? Well. Not exactly. Look, no one goes into a sequel expecting to be surprised, right? We go to be comforted, to lose ourselves completely in the sweet, Jujube stickiness of familiarity. So why should this bracket be any different? Sequels take the risk out of both filmmaking and filmgoing, which is probably why they’re so popular on both ends of the ledger. Seriously: Hollywood wags are quick to scold studios for pumping out parts two and three, but rarely utter a peep about the audience’s unslakable desire to see them. (People aren’t sheep; The Dark Knight Rises did better than, say, Rock of Ages or Abraham Lincoln: Vampire Hunter this summer because it was a better movie! Also because of this.) At the start, this Sequeltology tournament was filled with all sorts of secondary second installments and culty continuations, but even Han Solo post-carbonite could have seen where we were headed in the end. Yesterday’s Elite Eight matchups were total blowouts; anyone expecting the battle of Helm’s Deep would have been deeply disappointed. (Most likely they already are: All of Peter Jackson’s passionately adored sequels were dispatched before elevenses.) The remaining top seeds in the tourney whacked the competition as neatly as Michael Corleone on a boating trip with his brother. 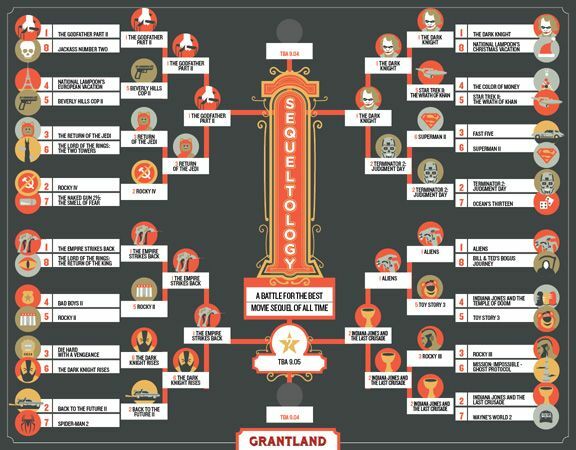 The Godfather Part II, a pre-bracket favorite among the dwindling number of pre-millennials on the Grantland staff, had no trouble tossing Return of the Jedi into the pit of Sarlacc. The former is that rare film that both transcends and deepens its predecessor; the latter culminated in a victory love-in with a tribe of steroidal gerbils. Still, it wasn’t all bad news in that galaxy far, far away (Marin County). The Empire Strikes Back is generally regarded by people who took college-level semiotics classes as the best of George Lucas’s interstellar adventures, mainly because of its hella dark ending. (Personally, I’ll always be partial to it for its educational bent; every time I’m underdressed in a snowstorm, I always keep an eye out for a space llama to gut. Plenty warm in there!) Despite its freshness in viewers’ minds, The Dark Knight Rises was totally sonned by the 32-year-old flick about a dark father. And there was a time when Terminator 2: Judgment Day was held up as an example of the rare alchemy necessary to make a hotly anticipated follow-up that was both auteurist and outrageously successful. But a metal Robert Patrick is no match for a mental Heath Ledger. By a ridiculously large margin, The Dark Knight rose again. 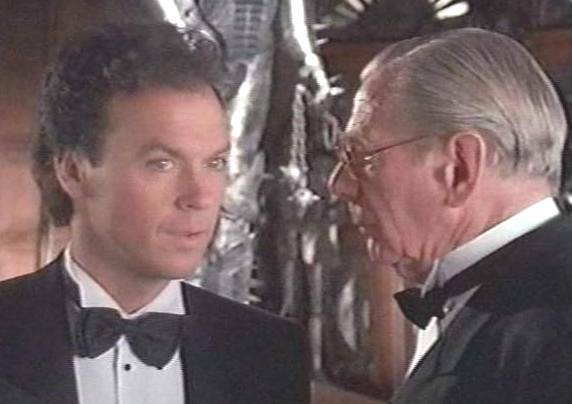 The only result to garner even a slight Michael Keaton eyebrow raise was Indiana Jones and the Last Crusade’s untroubled take-down of Aliens, a no. 1 seed. (When you think about it, James Cameron hasn’t had a day this bad since Suzy Amis banned Na’vi from the bedroom.) Aliens is a remarkable movie and, quite honestly, one of the few in this entire bracket capable of being judged on its own merits, not merely as a gaudy extension of a superior original. But here’s the sneaky thing about Indy 3 that you might have forgotten if it’s been a while since you last raced speedboats through Venice: It’s crazy fun! The script (ghost-written by Tom Stoppard) is a kicky delight and Harrison Ford and Sean Connery — neither known for a sunny disposition — seem to be having a blast out-ornery-ing each other. Ripley may have taken down the xenomorph queen, but she still got decked out of a dirigible by a graying archeologist. Don’t feel bad about her fate, Sequeltology voters. You have chosen wisely. And so we’re left with a quartet of worthy competitors, a veritable clash of titans. (But not a Clash of the Titans: it’s ineligible due to its lack of being a sequel. Wrath of the Titans was similarly disqualified but on the grounds of unmitigated awfulness.) In the bottom of the bracket, Last Crusade saddles up for a no-doubt quixotic confrontation with Empire. There’s a case to be made that the former is a more enjoyable film, but the latter is unquestionably more seminal. I expect not even the Jones family’s collective guzzle of immortality juice can save them from an ugly end in the swamps of Dagobah; the last thing they hear is the ominous sound of one hand clapping. The other matchup is a doozy, one that in a better world would be the championship. The Godfather Part II and The Dark Knight are two different generations’ consensus choices for the best sequel of all time. The aging cinephile in me wants to see the Corleone family’s dark reign continue in a new century. But I have a sinking feeling it’s not going to go that way. As Alfred Pennyworth once put it, there are some men — and movies! — who just want to watch the world burn.